Did I check on him periodically to see how the project was coming along? No way. I did not want to discourage him, but I did not want to make him feel like a failure either, if he left it unfinished. Lo and behold, by December, he told me he had finished and would I please edit it? He had invited me to read it before. I had replied that I would read it when it was complete. Now I had to deliver. I made time to read my child’s words on a screen – all 15,894 of them. Honestly, I had enough on my plate and, with the holidays and some publishing deadlines of my own, things felt pretty stressful. I transferred his book onto my laptop and took it with me when we went to tae kwon do. While sitting through their training for one hour, I read 10%. It gave me hope that I could edit it in a few days. So I told him, “I edit it in December, we publish in January.” My graphic designer gets projects done pretty fast and yes, we got it done in the first ten days of January. It took me a bit to get into the action – it’s an unofficial Minecraft novel and I have played Minecraft exactly once because I do not want to play it again. Video games do not excite me. Our son only plays Minecraft three times a week, 30 minutes at a time. Sometimes he goes weeks without playing it. He is a fan, but does not obsess over it. We have not allowed our children to have screen time beyond 30 minutes a day, unless they are learning typing or programming. So we do not have a subculture of video games in our home. But, when your child reads a lot, and then plays a bit in the Minecraft environment, he starts making connections. 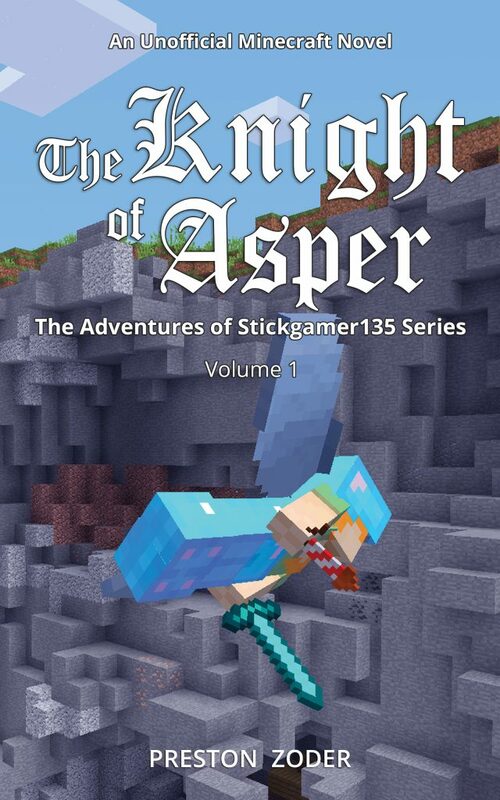 The Knight of Asper mixes elements from Arthurian legends, fantasy novels, Bible concepts, and Minecraft details. Of course we are proud that our son should have such an imagination. My focus though was on making sure we turn this into a writing lesson. As I edited his manuscript, I showed him what a word processor can do: Find and Replace, Spellcheck, all that good stuff. He did pretty well in punctuation and capitalization – that was impressive. I did not know that he knew a character’s thoughts are represented by italics, for instance. He is proud of his book, too. For the first two days after going live on Amazon, The Knight of Asper was the #1 New Release in his book category. Our son is now working on a sequel, as well as two other books: one is a diary of our kitten and the other a sci fi novel. I am just as amazed as you are. He has read a lot in his short life, my son, and we have a great writing curriculum (Writing with Ease by Susan Wise Bauer). This made me want to continue with Ms. Bauer’s next level, Writing with Skill. Congrats to him on releasing his first book! I’m glad he is inspired to continue writing! My daughter, too, has begun writing long stories and is asking me about how to publish. Thank you for the inspiration; I had not thought about using Amazon as a way to share and release a book. It’s been impressive to me to see how consistently she writes and progresses. Here’s to more young writers!